It’s true! A large section of the Hedonisia Hawaii property consists of a huge volcanic crater. 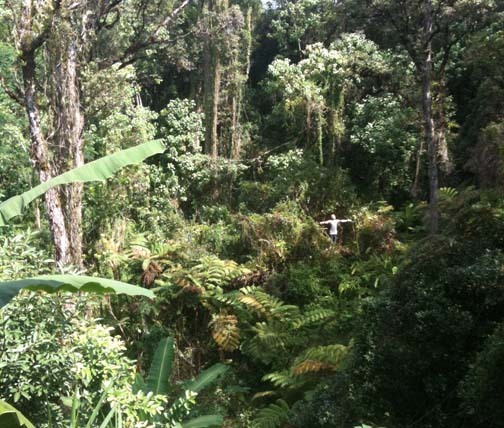 Based on the size of the Ohi’a trees located in the crater we estimate that it is at least 250 years old. We have built a rough trail into the crater which guests are free to use to explore this natural wonder. As you enter the crater you will notice that the air gets steamier and moister as there is very little breeze down there. Be sure to ask for the location of our “Lava Tubes” which are basically hollow transport tubes left by the lava as it dried and hardened hundreds of years ago. Slowly, slowly, we have cleared the weeds, given care to the native Ohi’a Fern (Hawaiian Tree Fern) and Kava in the crater. In 2013 we built our most Eco-friendly structure in the crater which we call Puka Hale. 75% of the building materials used are locally sourced Bamboo and Strawberry Guava trees many of which grew right on the property. In many cultures around the world, when a woman is menstruating, she is shunned and ostracized by her society. Here at Hedonisia Hawaii, we celebrate the connection of woman and nature. The Moon Garden is a sacred area in the crater which we are slowly creating as an homage to women’s fertility and her Monthly cycle! Red leaf plants or trees that produce red fruit, have been planted in the moon garden to represent the natural fertility cycle. During her cycle, we invite women to the moon garden who use eco-friendly sanitation methods such as a Diva Cup or organic tampons, to bury their offerings within the red plants. It is meant as a simple symbolic and ceremonial connection between Mother Nature and the feminine. Not Child-Friendly: A Natural Danger. Despite our attempts to ‘civilize it’ with trails and paths, the fact remains that our little crater is still a natural formation with dangerous cliffs, cracks and lava tubes throughout it. As a result, we have a strict Community Children’s Policy for allowing children to stay on the property on a longer-term basis than a few nights. Cut down baby Albezias when you see them crop up. Verify before cutting, ask someone if you’re not sure. Update plant pages if any are added or deleted from the garden. Check with the director first about topping a tree or if you have any ideas for new red plants in this area.